as it will costs less than R2 000.
the actual prosthetic hand,” said Mohamed, now a lecturer and PhD candidate. Over the last few years, Mohamed has allowed engineering students in their fourth-year to take up the project in their last six weeks of study as part of their final year project. m“I needed to create a stream of projects that would fit into the course work. The hand itself is already built in such a way that students can put in six weeks to work on it,” said Mohamed. Fourth-year Information engineering student, Nabeel Seedat, has spent the last month figuring out how users would be able to feel what they were touching. “The big issue with prosthetics is the inability of the person to feel when they are holding or gripping objects. Our goal was to add sensory feedback and incorporate force sensors so the hand could be realistic to the sensors in actual hands,” said Seedat. The prosthetic itself is a 3D printed object made of plastic. This method of developing the hand is one of the reasons why it will be aff ordable. Seedat’s classmate, Irfaan Mohamed, explained that 3D printing eliminates the option for importing parts. “It is not that expensive to reprint the prosthetic and that cuts costs a lot. 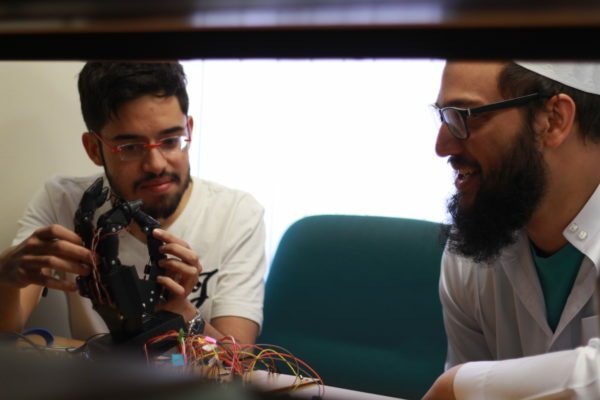 Your average prosthetic hand in South Africa costs around R15 000, and that is just a hand that has no movement or gripping capabilities,” said Irfaan. Seedat and Irfaan have been working on sensory functions for the prototype and have produced their own force sensors to assist with the gripping and force functions for the prosthetic hand. “Because the hand is plastic, we need to find ways to ensure that the hand will not be destroyed by simple things like heat.” Therefore, the sensors will allow the user to let go of certain objects which may burn or destroy the hand,” said Seedat. Vicatos and his Masters student at the University of Cape Town, Severin Tenim. However, that one didn’t have the sensory function.